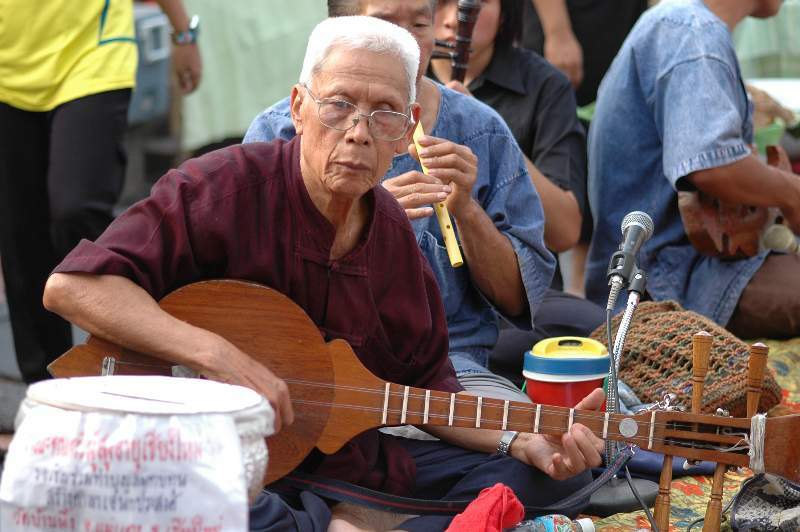 The Seung is a four stringed thai instrument from Northern Thailand. A popular instrument it is held against the body and plucked with the right hand in a similar way to the guitar. The instrument has nine frets and is similar in many ways to the Gra Jup Bee ( also a 4 stringed instrument ) which has 11 frets. The Seung is smaller though. Possibly related to the Chinese style "moon lute" which has a bigger body and smaller neck. Traditionally the Seung is made from one piece of hardwood however it is common to see instruments made now with the neck attached to the body in the same way as a guitar. The neck is square shaped. The tuning slots are carved out and pegs are inserted to attach and make the strings tunable. Two of the strings are small and two are larger heavier strings. The seung is played by itself and also with the Pi Saw ensemble.